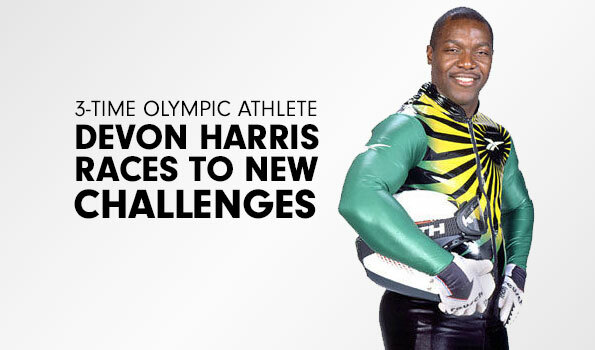 Born on Christmas Day, 1964 and raised in a violent ghetto environment in Kingston, Jamaica, the greatest gift Devon Harris ever received was the belief that a positive attitude and a never say die philosophy would carry him farther than a sense of injustice and a heart filled with anger. A graduate of the prestigious Royal Military Academy Sandhurst in England, Devon received a Queen’s Commission in December 1985 and served in the officer corps of the Jamaica Defence Force until December 1992 when he retired as a Captain. At the heart of Devon’s message are the lessons he has learned of the power of persistence over all sorts of obstacles in order to live one’s best life. His mission is to bring this message of how everyone can keep on pushing and working for their dreams every day of their professional as well as personal lives. 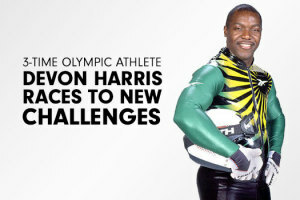 Encouraged by his commanding officer, Devon tried out for and was selected to the first Jamaican bobsled team which competed in the 1988 Olympic Games in Calgary, Canada. Their exploits inspired the Disney blockbuster movie Cool Runnings. Devon also competed in and was captain of the 1992 Winter Olympic Games in Albertville, France and the 1998 Games in Nagano, Japan. The Keep On Pushing Foundation which he founded in 2006 aims to support and enhance the education of kids in disadvantaged communities around the globe by providing practical solutions to the challenges that are preventing them from getting educated. As an ex-serviceman, Devon understands the commitment, sense of duty and sacrifices made by those who volunteer to serve. As a private citizen he is cognizant of the fact that the freedoms he enjoys are paid for by the courage and sacrifice of these men and women. As a result he has also devoted time to visit the troops serving in the Persian Gulf. Devon also works with Right to Play as an athlete ambassador, supporting Right to Play’s efforts in using sports and play in refugee camps around the world to enhance child development and build community capacity. He is the author of the motivational children’s book, Yes, I Can! and the semi-auto-biographical motivational book Keep On Pushing: Hot Lesson From Cool Runnings.